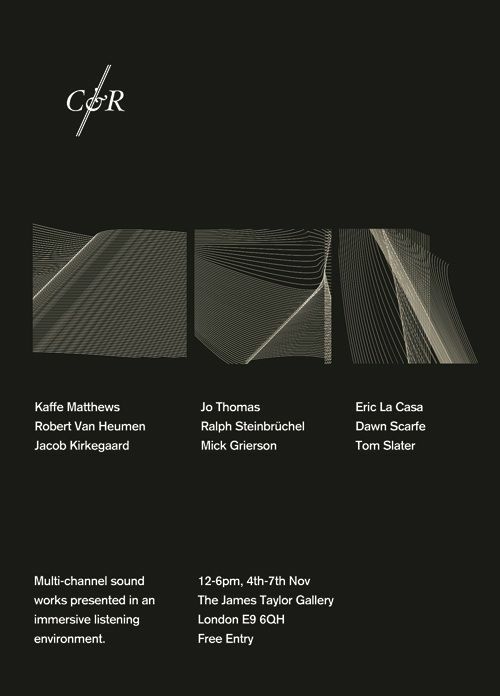 Call & Response (C&R) is a London-based independent sonic arts collective dedicated to the practice, exhibition, and curation of sound art in the capital. Our programme launches in November 2010 with a four-day residency at the James Taylor Gallery, Hackney. Our residency presents international sound art to a London audience, in a unique listening environment located in an expansive Victorian factory in East London. We will be presenting multi-channel works by Kaffe Matthews (Annette Works), Robert Van Heumen (STEIM), Jo Thomas (En'Tracte), Jacob Kirkegaard (Touch), Ralph Steinbrüchel (12k), Eric La Casa (Room 40), Mick Grierson (EMS), Tom Slater and more. These will be on rotation from 12-6pm, 4th-7th November and entry is free throughout. For full details of the programme please check our website. We will be presenting an evening of international performers utilising our 8.1 surround sound system on the evening of Friday 5th November. A-R-A-R (UK) are homemade electronics duo Vasco Alvo and Louie Rice, on AM/FM Keyboard and Tone Generator. Andre Avelas (PT) will present a performless solo generated by musical automata. Brian Mckenna (US) will perform an audiovisual work using feedback and harmonic distortion. Adam Asnan (UK) will present a 12 channel work utilising mobile cassette players, and Kaffe Matthews (UK) will perform a live multi-channel piece. Tickets will be available on the door and in advance (£6/£4), please check our website for details.